As you may have known, one of the best ways to score in PES is via through balls, or at least in my gameplay. Both normal ground through passes, as well as chipped through passes, are brilliant at splitting defence! We just need one or two good passers in your team to use this tactic to the fullest. In this post, I would like to share some of my grounder through pass techniques and show you some examples of my goals. In the next post, we shall cover chipped through pass in PES. Let me first show you the position on the field where I play my through passes. The red circles in the picture below show the position where I play my through passes. In the picture, the direction of attack is from left to right. My preferred positions are more towards the flanks. 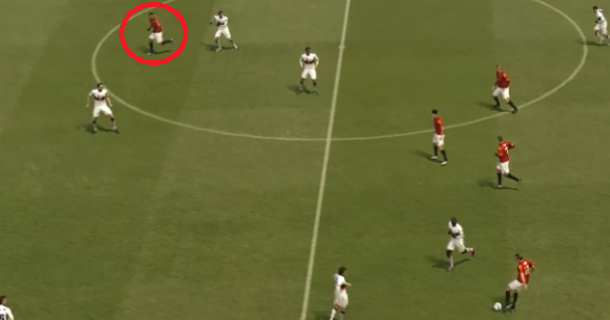 I find that the angled through passes from these positions make it hard for the defence to intercept in PES 2011! Most of the time, I will use my wingers to make through passes when they are close to the halfway line. Before making a through pass, keep an eye on your forwards. Your forwards will tend to make runs into the box numerous times during a match. When you have the ball in these positions, fix your view on the pitch, not the radar. The radar doesn’t show the runs as clearly. Hold the ball till your forward is in line with the last defender, and charge up your through pass and send it to him. The power should range from 5/8 to 7/8. I find that in PES 2011, the system will aid your accuracy in your through passes. And it is not easy to defend against a through pass as well, so we should use this to our advantage. At other times, when your forwards just can’t seem to make good forward runs, we will have to order them to make runs. When your forward has the ball, pass the ball to your wingers, and double tap R2 after he makes the pass. This will order him to run forward, and you will be able to play a nice through pass in his direction. And one more thing to recommend. During counter attacks, the defence will be empty. When you have the ball and are near the halfway line, try to go with the first method and play a long through pass. This speeds up your counter attack greatly! During build up play, the defence is much more crowded. It is not feasible to play a long through pass from the halfway line. Here is when the second method comes in, where you would need to use a 1-2 pass to play a through pass to a forward running into the box. Please take a look at these video. It shows of how I play through passes from many different positions to split the defence, giving you a much better understanding of how you can apply this technique in your own game. I hope you find this useful! And the chipped through pass tutorial will be up soon! Leave me comments to let me know your views. Thanks! Thanks for the heads up. Will look forward to it. Btw, a free-kick tutorial will be greatly appreciated too. great post.this and the crossing tutorial helped me make a serie of 20 victories at online pes league.by the way how can i open the protected posts? Nice, will try to use this. How good does the midfieldpasser be at passing? thanks alot pal for the valuable info and i want to ask a question regarding the R2 button , is this way effective to attak from the middle of the defence using this technique rather than the wings. another question might not be related but some times when i’m playing on line and facing some apponents i find it diffecult to take possition of the ball, the opposite players are rushing into me like hell is broken loose the passing is so diffecult to be handeled and i always end up loosing the ball any recommendations and many thanks again for the wonderful site pal. I find that for through pass, it is harder to attack from the middle as it is more crowded and harder for the pass to get through the crowded defence. Hope it works well for you! Generally if you know that the player is a good passer in real life, you should try to use him as the playmaker in the game. I think a passing accuracy and speed of over 80 is a decent start. You should have received the password! Sorry for the confusion, I was refering to the amount of power you should put in for the pass. The power bar should be 5/8 to 7/8 filled for a good pass, depending on your positioning. yes i received it Neo thanks.one advise,when you want to get away from opponents pressure just play one-two passes fast and by this way opponent can’t guess where the ball will go.one-two passes makes your game unpredictable. I also agree with Alexandros regarding the 0ne-Two pass it is really effective if its applied correctly! May I clarify what is a double pass? This through pass is sick, defenders aren’t that AI intelligent, please keep up the good work for solution on defending strategy.